On my RetroPie machine I wanted a hardware volume knob — the games I play use a handful of emulators, and there's no unified software interface for controlling the volume. The speakers I got for my cabinet are great, but don't have their own hardware volume knob. So with a bunch of googling and trial and error, I figured out what I need to pull this off: a rotary encoder and a daemon that listens for the signals it sends. A rotary encoder is like the standard potentiometer (i.e., analog volume knob) we all know, except (a) you can keep turning it in either direction for as long as you want, and thus (b) it talks to the RPi differently than a potentiometer would. I picked up this one from Adafruit, but there are plenty others available. This rotary encoder also lets you push the knob in and treats that like a button press, so I figured that would be useful for toggling mute on and off. You can use whichever pins you want; just update the script if you change them. Since the GPIO pins are just for arbitrary signals, you need a script on the Pi that knows what to do with them. The builtin GPIO library for the Pi will do nicely for this. You'll see the script below, but here's how it works: it listens on the specified pins, and when the knob is turned one way or another, it uses the states of the A and B pins to figure out whether the knob was turned to the left or to the right. That way it knows whether to increase or decrease the system volume in response, which it does with the command-line program amixer. First, make sure amixer is present and install it if it isn’t. Create a bin directory in your pi folder if it doesn't exist already, then drop the script below into it. You should also play around with the constants defined at the top of the script. Naturally, if you picked other pins, you'll want to tell the script which GPIO pins to use. If your rotary encoder doesn't act like a button, or if you didn't hook up the button and don't care about it, you can set GPIO_BUTTON to None. But you may also want to change the minimum and maximum volumes (they're percentages, so they should be between 1 and 100) and the increment (how many percentage points the volume increases/decreases with each "click" of the knob). If it's working the way you want, you can proceed to the next step: running monitor-volume automatically in the background whenever your Pi starts. NOTE: If you're on a version of Raspbian before Jessie, these instructions won't work for you. Hopefully someone can pipe up with a version of this for init.d in the comments. If that worked right, then you just told Raspbian to start up that script in the background on every boot (enable), and also to start it right now (start). At this point, and on every boot after this, your volume knob should Just Work. I've heard that in earlier versions of Raspbian, the pi user isn't automatically allowed to access the GPIO pins, so you need to run scripts like this as root. If you're running into permissions errors when you try to run the script from your shell, then that's your problem, most likely. There's no particular reason why you shouldn't run this script as root, except on the general principle that you shouldn't really trust code that you didn't write. Make good choices and have backups. I might have made a typo in the gist. Wouldn't be the first time. If you run into trouble, leave a comment and the internet can help you figure it out. The volume knob is a rotary encoder. It turns infinitely in either direction. turn muting on or off. # The two pins that the encoder uses (BCM numbering). # The minimum and maximum volumes, as percentages. # serious speakers or something, your results will vary. # volume-changing will happen in the main thread. # queue completely each time through the loop, so it's guaranteed to catch up. A class to decode mechanical rotary encoder pulses. The callback receives one argument: a `delta` that will be either 1 or -1.
yet which one is which. # set high, it'll be reverse. 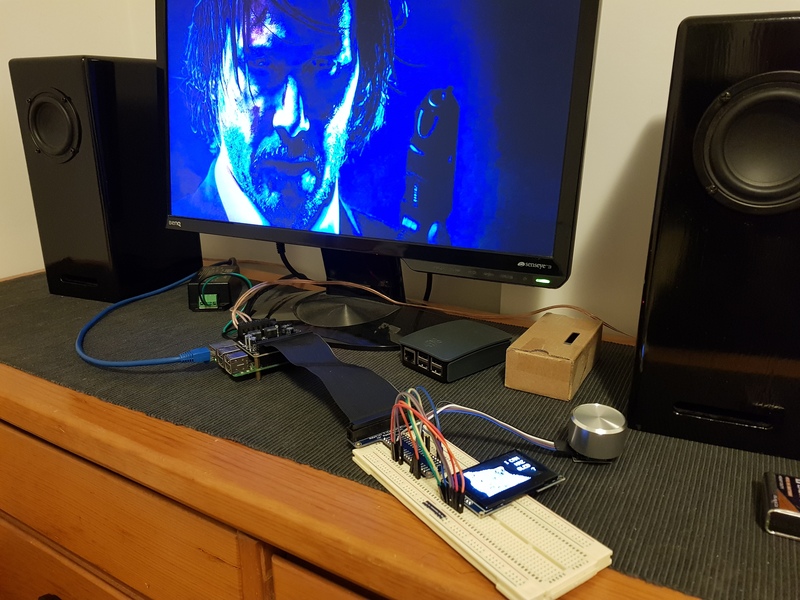 A wrapper API for interacting with the volume settings on the RPi. # Set an initial value for last_volume in case we're muted when we start. Increases the volume by one increment. Decreases the volume by one increment. Sets volume to a specific value. Toggles muting between on and off. # value we had because we'll want to restore it later. # Read the output of `amixer` to get the system volume and mute state. # string scanning and not regular expressions. # mute state ("[off]" or "[on]"). # In between these two will be the percentage value. # Ensures the volume value is between our minimum and maximum. # turned we're not looping at all. # timeout, then Ctrl-C works as intended. No idea why. Great idea savetheclocktower! I have been looking for something JUST LIKE THIS for my standup arcade machine for ages. I run my machine on recalbox (a retropi competitor), but they appearently run python 2.7 and this is python 3 code. I found this project https://wiki.python.org/moin/3to2 which on converts python 3 code to python 2.7 code, but I am a "user" , not a coder, so I can't figure out how to use it. Would you please consider creating a python 2.7 compatible version, so I could use your wonderful idea in my arcade cabinet too? If I wanted to use 3 push button rotary encoders to perform say volume/mute, up-down/enter, track/pause, would I need multiple scripts and monitor services? However, you might nonetheless choose to use multiple scripts/services. Since we're not constantly asking for the status of the pins, and are instead relying on the interrupt to tell us when the pin status changes, running several scripts at once would have a negligible effect on performance. And the code above is complicated enough that you probably won't have fun hacking it to listen on nine pins instead of three. If I were in your position and had multiple rotary encoders on the same machine I'd probably clean this code up and hide the ugliness in a module that each script could import. That way the volume-changing code wouldn't be all tangled up in the rotary-encoder-interpreting code. Changing the PCM references to Master in the script fixed the problem. @thijstriemstra Glad you got it working! Now I vaguely recall having to install alsa-utils. I don't think I had to install those other three. I'll make a note in the gist. I ended up using a potentiometer with an MCP3008. Modified your gist with instructions here: https://gist.github.com/thijstriemstra/6396142f426aeffb0c1c6507fb2acd7b, cheers. Does anyone have any help? I'm kinda new to python and physical computing. And thanks so much for putting this out there! I'm building an audio book player for my kids, and this is perfect! @johnnydcakes Try running amixer set 'PCM' mute in a terminal and see what it does. For whatever reason, that command seems to be returning an error for you when the script invokes it. The volume knob is working fine adjusting up and down, it's just the mute. I can't figure out what's up here. Just so you know, I'm using a RPi Zero W with an Adafruit Audio Bonnet. I don't seem to be able to use any command to mute the volume through amixer at the command line. @jonnydcakes Try running just amixer and looking at the group names. One of them is probably what you should be using instead of "PCM." I was able to get the button to mute the sound by replacing line 202 with output = self.amixer("cset numid=1 0%) but obviously pressing it again won't return it to the previous volume because the program can't tell it is muted. For whatever reason, I don't seem to have the mute function available in amixer. So it looks like PCM is the only card available. I wonder if it has something to do with running audio out I2S and the custom stuff you have to add to get the audio bonnet to work. Here is the special audio conf code for the bonnet from /etc/asound.conf. I'm not really familiar with what this code does, so maybe the muting function is not available because it isn't allowed here? Hi, I really like this project so I decided to give it a try for my raspberry pi radio I am working on. I used the same rotary encoder as mentioned in the instruction and I also used the same GPIO as in the script. When I initially ran the script I had to change PCM to Master because I have a Pimoroni Phat DAC as my sound adapter. Needless to say it all works fine. However, when I run the script it mutes my audio completely, the encoder reports that the volume increase and decrease as I turn the knob but there is no audio coming from my speakers. The only way to restore my audio is to reboot. Has anyone had this happen to them and can anyone give me a hand. Thanks in advance. Hey @savetheclocktower Any chance you could post a pick of your setup? The link to it is dead. @mizzoudavis The dead link was just a diagram of the RPi GPIO pins. I updated the link to point to pinout.xyz. Thanks! I've tried your code and works perfectly. My objective is using a rotary encoder to control 2 Led's , the left led lights up during the period that the encoder rotates left, right led lights up during the period that the encoder rotates right. Can you help me ? thanks for this awesome tutorial. I'm very new to programming in general and python/raspberry in detail. Your code works fine for me except one problem. The volume will only vary between two values (e.g. 31 to 32). I'm not sure if this explains my problem well enough. I hope you have an idea how to fix this, since I've checked various sites and didn't find a trace to a solution. I'm more of a duct tape and cable ties kind of coder but I thought I would share in case it helps someone else. Came across this project while building a standalone AV Reciever sort of thing, hit some of the same hiccups as others along the way but managed to get it working for now. Writing this up from memory from last night so I might do a clean install and make sure I've covered everything later on but I'm pretty sure this is everything I did. As I was using it on OSMC (latest stable build) with a HifiBerry Amp2 there were a few tweaks that I needed to do to get it up and running. I have heard that using pip to install RPi.GPIO is the wrong way to go about it, but it did work, maybe someone can clear that up. I also had a similar problem as @jonnydcakes with the audio sink so after a quick google I came across this which flagged that the audio sink was 'Digital' so essentially replacing "PCM" within the following lines with "Digital"
That might be a security risk, maybe someone wants to correct me on that but for now it works. Again I'll probably be doing this on a clean install to see if I missed anything. As this doesn't show volume changes on the GUI I might look into @JamesGKent's approach once the Kernel within the stable branch of OSMC reach the requirements (4.20 I think?) as I'm assuming that as it replicates (+/-) keystrokes it would. Getting error noted below, help please! @GRigdon see this comment for some guidance. first off, thank you so much for this project--i appreciate all the work, it's been super helpful. everything runs perfectly from the command line, but i cannot get it to work as a service. it claims to be running, but there is no effect--turning the encoder does nothing. Jun 19 23:34:14 raspberrypi systemd: Started Volume knob monitor. i am just wondering if anyone else is encountering this. Thanks! Awesome project, thanks! I got it working so that the mute button works and I can change the volume. Only problem left: It only changes volume down to 74% (which funnily is the initial Volume) to 100%. I did change the maximal/minimal Volume in the script (ln 46/47), but that did nothing. Can somebody please point me in the right direction? Using a usb-soundcard and python 2 (2.7 I believe). I'm following all the steps unfortunately I take the following output but the knob seems not to be responded. Hi @savetheclocktower, thanks for this nice script. I linked to you from my own similar project, because I find yours easier. The reason I wrote my own is that I need it to also be able to create JACK MIDI messages, which means it has to run under realtime constraints. The Python JACK API is very nice, but it wouldn't give me the performance to run at low latency. If someone here has a similar itch to scratch, can I humbly suggest to check out https://github.com/nettings/gpioctl . Otherwise, by all means stick to Python!